In a world of disposable goods and overflowing trash barges, it’s nice once in a while to come across a beautiful, award-winning book that touts the merits of saving and re-using. Long before recycling was even cool, the titular Joseph understood that when things become old, you shouldn’t just throw them away. You can create something new and wonderful out of them! 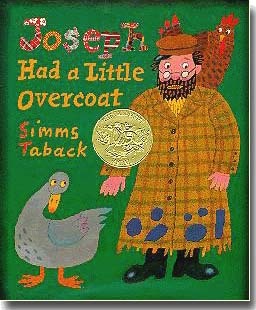 In Simms Taback’s Caldecott Medal book, “Joseph Had a Little Overcoat”, based on a Yiddish song from Taback’s childhood, Joseph wears his overcoat until it gets so old and shabby he must make it into a jacket. When that jacket loses its luster, Joseph makes it into a vest. And so on and so forth until all that’s left is a button which has its own clever uses. Stunningly illustrated and easily singable, Taback’s book is a beautifully crafted fable that will hopefully raise new conversations with our children about the beauty of finding value in something old.